Little Bay Pet Services LLC – Ask the Vet: Can I Prep My Pet for Winter? Ask the Vet: Can I Prep My Pet for Winter? Q: How can I best prepare my cat and dog for the colder weather? A: Most pets are able to tolerate most weather in the colder months, as long as they have had time to acclimate. Extreme weather conditions are an exception. If extreme cold or severe weather is headed your way, pets should be kept indoors if possible. In general, though, if your pets spend most of their time inside or in the warmer climates, you will need to shelter them from the cold or introduce them to the lower temperatures gradually. Be sure your pets’ feet are clean and dry every time they come inside, either from a trip to the yard to potty or from a long walk. If moisture and/or salt gets on an animal’s paws, he may lick them excessively, which can lead to irritations and infections. Rinsing and drying the feet after each walk is always a good idea. Keep in mind, antifreeze is a deadly toxin to pets. Most contain ethylene glycol, which will severely damage the kidneys — even in small amounts. Keep this product out of reach in your garage, be sure your radiators are not leaking and keep your pets away from puddles in the winter (and in the summer). You never know if someone’s radiator was leaking on the street. During the holidays, vets see more foreign-body ingestions than at any other time of the year. Thanksgiving brings ingested bones and Christmas brings tinsel, foreign bodies and chocolate toxicity. Pet-proofing the house just as you would for small children is always a good idea. 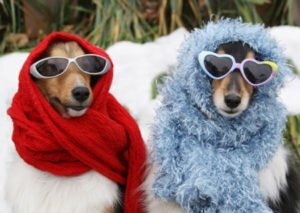 Winter should be fun and exciting, but a little bit of caution will go a long way toward helping to keep your pets safe through the season.